I couldn’t wait any longer to show you this amazing and eyeboggling skirt! Minerva Crafts and The Sewing Directory have been teaming up for the Minerva Blogger Challenge. Sewing Directory post various Minerva products on their site and bloggers are invited to email and say what they’d make from it. I entered to make something from their new range of premium cotton prints! I originally chose the safety pin fabric but it was too popular and sold out. 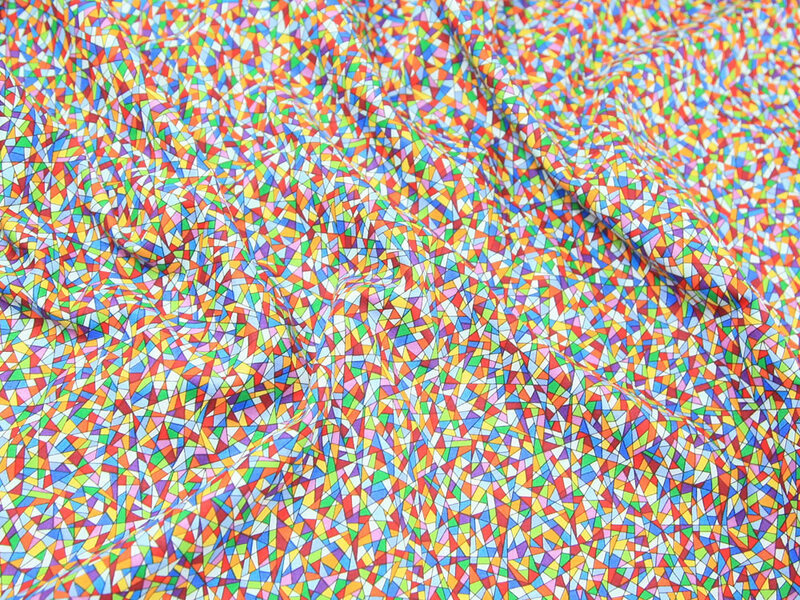 So my back up was this lovely colourful Mosaic print. My plan was to make a dress and I decided the weight and drape of the fabric would work well with the Belladone dress. There isn’t really a predominant colour so I went with purple for my contrast binding and topstitching. Now a lesson learnt is that you can’t sew bias binding around a neckline, then unpick it all and expect to redo it like nothing happened. I totally stretched out my neckline!! Beyond saving as well. I was so sad and didn’t have any spare fabric to work with. I mean look at this gorgeous binding that has gone to waste. The topstitching on my first go was appalling though (think “drunk monkey”). Determined to not waste this lovely fabric, I decided to follow up on my plan to try a belladone skirt. 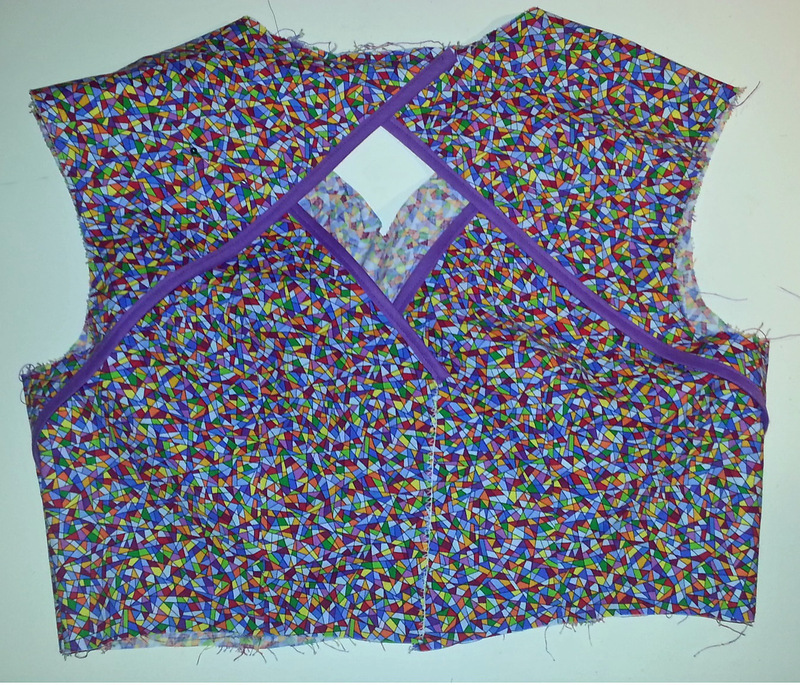 It’s super easy to do, you just make a waistband facing and use a shorter zip. I had a perfect size purple invisible zip in my stash too! Ok so a bit more about why this fabric deserves the name “premium”. The fabric didn’t bleed at all. Not remotely! Surprising given the vivid and various colours in use. The weight and drape is what you expect from the high quality cotton you see in shops like Backstitch, Frumble and Fabric Rehab but without the same price tag. Minimal creasing. I love wearing cotton but I hate looking like a crumpled mess by the end of the day. Even though it would be hard to tell in this print, I wore this skirt all day at work. That’s a lot of sitting on trains and at desks and in meetings but the skirt barely creased. Now I just need to wait for that safety pin fabric to come back in stock so I can buy myself some. Yippeee. I love this fabric. 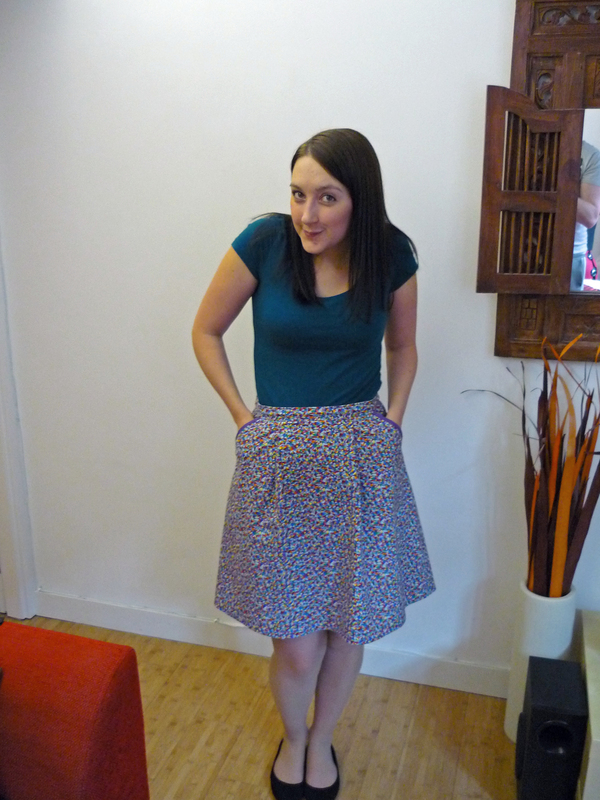 I think this Belladona Skirt is a great save! Thank you! Phew so relieved I didn’t waste this fabric! Nice save! I never thought of making the Belladone as a skirt but it works perfectly. I am nearly finished a Belladone dress, and spookily enough, I was thinking about what a Belladone skirt would look like! Your’s is fab, and, oh boy, do I love that fabric! What a shame about the neckline, because the bodice looked great. I still have the neckline and hem to do on mine, so I’ll be taking your advice on working on the neckline. How cute! I’m sorry that the dress didn’t work out, but the skirt is adorable and a great save! Thank you m’dear. At least I have one belladone dress that was a success and now I have a cute little skirt too! So glad you got to save it because this fabric is so cool. It looks great! Aw sorry that the Belladone bodice didn’t work out but the skirt is great! 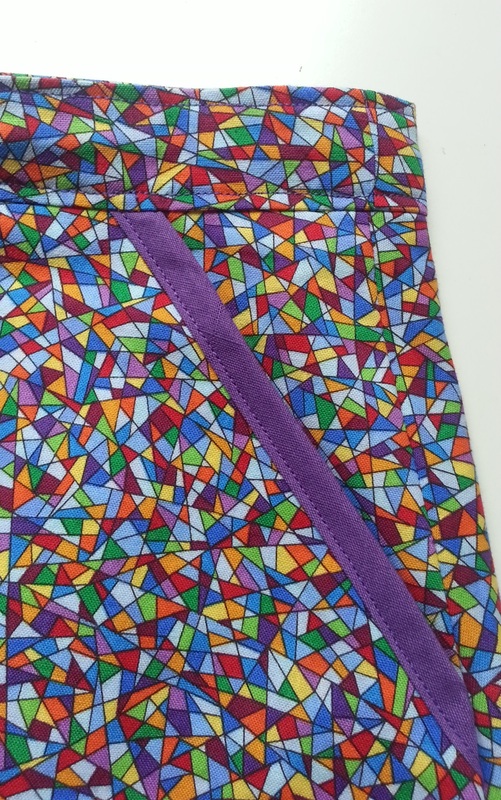 I love the purple binding with this fabulous stained glass looking fabric. That fabric is gorgeous. 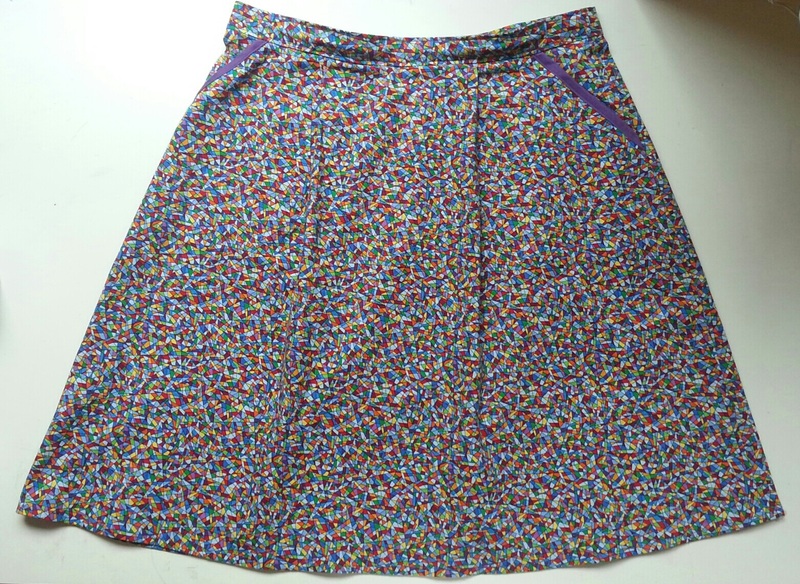 Great save- the skirt is super cute, and I love the purple binding so much! Thank you! I love purple so it was a great excuse to play with purple binding! Thank you! You’re such a funny one. Heehee. Used up all my stock of purple binding too! But I’m happy with the results, thank you. looks great Amy, the fabric is so much fun! Gorgeous! And super save too! nice work. what a good save! must check out that fabric! Thank you. Good old Minerva supplying juicy fabrics to the masses! Shame about the bodice. But what a great skirt. Excellent save, my dear. I love that you can’t be defeated by a stretched out neckline! This genuinely does look fab as a skirt as well, I think it allows the cute slash pockets to take centre stage!